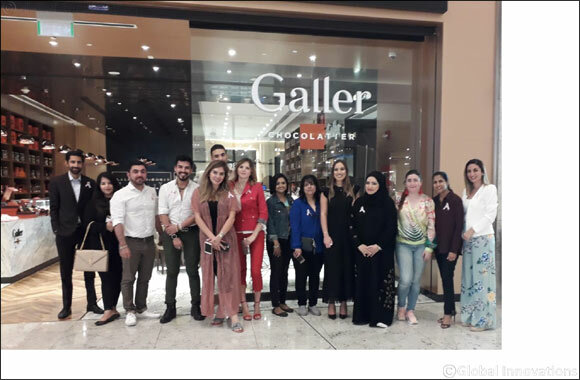 Doha, Qatar - November 5, 2018: In observance of the International Breast Cancer Awareness Month, Galler Chocolatier, Qatar’s unique boutique and dining space, joined hands with the Qatar Cancer Society (QCS) to organize a health drive against one of the most curable types of cancer, which due to lack of awareness and timely treatment continues to take thousands of lives every year. The health session at the Mall of Qatar, saw Galler Chocolatier swept by a sea of pink decoration, while all proceeds from ribbon sale were donated to Qatar Cancer Society, in bolstering their efforts in advocating breast cancer early detection across the country. Aisha Al Tamimi, a cancer survivor moved the audience by narrating her personal story and affirmed her belief that the disease can be challenged when addressed effectively. Breast cancer is the most common type of cancer affecting women worldwide, accounting for 16% of all cancer types. It is notable that in Qatar a large number of breast cancer patients are diagnosed in later stages thereby decreasing their chances of survival.